​Professional climbers Kevin Jorgeson and Tommy Caldwell recently inspired the world by completing world’s most difficult free climb – The Dawn Wall – on El Capitan in Yosemite National Park. After 7 years of preparation, planning, and training, Kevin and Tommy spent 19 days making the first free climb of the 3,000 foot vertical granite monolith. Kevin has been climbing since he was born, but it doesn’t run in the family. Rather, it’s his passion for being in the outdoors mixed with a child-like curiosity for human limits that drives Kevin upwards. Kevin grew up spending time in the outdoors with his dad, hiking, white water rafting, ﬁshing, hunting, and camping. At age 10, he discovered the sport of rock climbing and never looked back. By age 17, he was an International Champion and by age 25 was considered one of the strongest climbers in the world. 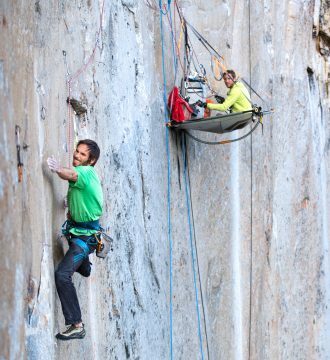 Kevin joined Tommy on the Dawn Wall project in 2009 and 7 years later, finally succeeded. Tommy rose to the top of the competition circuit quickly and started establishing the hardest roped climbs in the United States as a teenager. On an expedition to southwest Kyrgyzstan in 2000 Tommy and three other climbers were taken hostage. For six days they survived on no food and little water and eventually escaped when Tommy pushed their remaining captor off of a cliff and they ran 10 miles to a military outpost. Just one year after his hostage epic Tommy had a home remodeling accident and cut off his index finger with a table saw. This only increased his resolve and Tommy soon became the world’s most proficient big wall free climber. 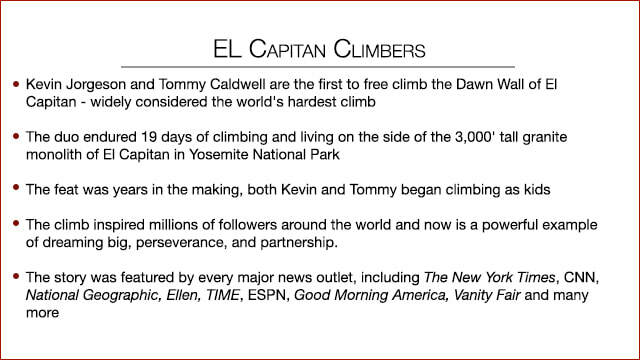 Kevin and Tommy have been featured in the New York Times, TIME and National Geographic and on The Today Show, Ellen, ESPN and CNN. It started with a dream. For 50 years, the 3000' tall Dawn Wall of El Capitan in Yosemite was considered impossible - too tall, difficult, and dangerous. After 7 years of effort, professional climbers Kevin Jorgeson and Tommy Caldwell succeeded with an epic, 19-day ascent of the world's hardest climb. As President Obama said to Kevin and Tommy: "You remind us that anything is possible." This incredible story inspires all to seek out and climb their own challenges; to find their own Dawn Wall.